First-ever stackable Tiki Tiki Totem piece depicting Commander Uhura from Star Trek: The Original Series. Collect Tiki Tiki Totem pieces and create your own custom Tiki Tiki Totem pole. Enjoy your Tiki Tiki Totem from every angle with stunning 360-degree artwork. The Star Trek: The Original Series Commander Uhura Tiki Tiki Totem from Entertainment Earth takes your love for the Star Trek to new heights. This stackable wooden figure features spectacular 360-degree artwork crafted with hand-painted details and limited decal elements, so you can enjoy it from every angle. Create your very own custom wooden Tiki Tiki Totem pole as you collect your favorite characters and stack them on top of one another using the interlocking sections (on the bottom and top of each piece). 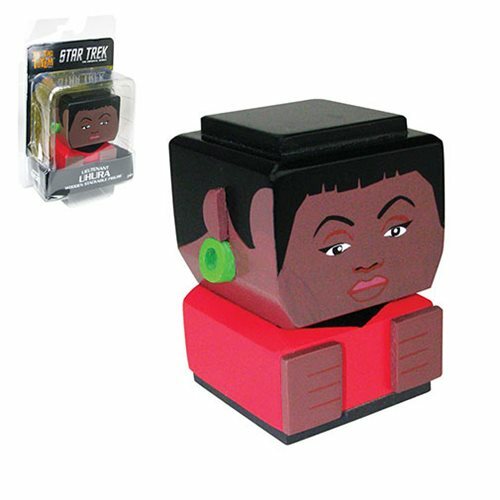 The Star Trek: The Original Series Commander Uhura Tiki Tiki Totem measures approximately 3-inches tall (subject to change). Ages 14 and up. Thor and Hulk Classic Tiki Tiki Totem Set of 2 - Con. Excl.